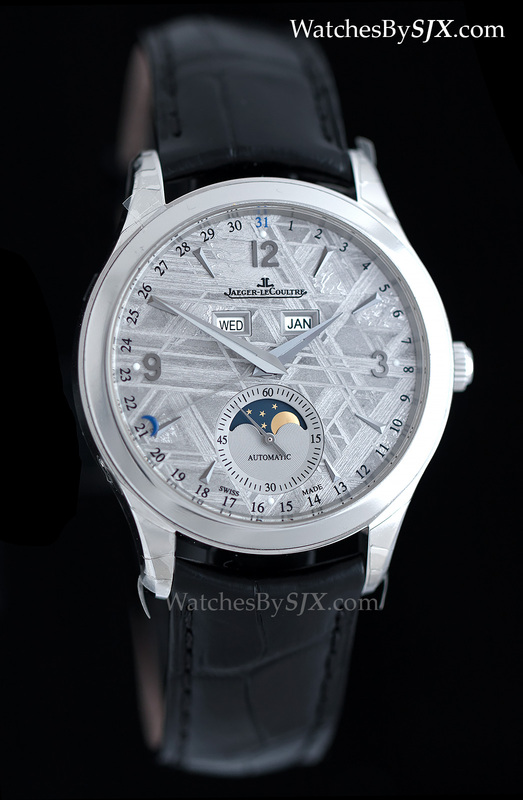 The Jaeger-LeCoultre line-up at SIHH 2015 was heavy with moon phase watches, including the Master Calendar Meteorite. 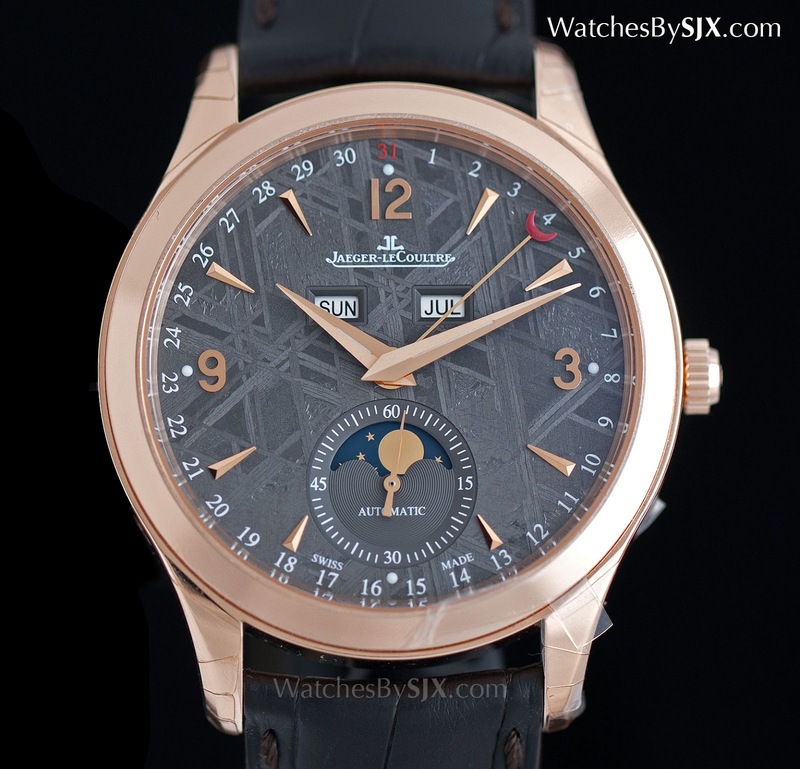 Part the JLC collection starting the nineties with a short interruption in the mid-2000s, the Master Calendar is styled like a mid-20th century triple calendar watch, sedate and functional, except it’s now offered with a meteorite dial. 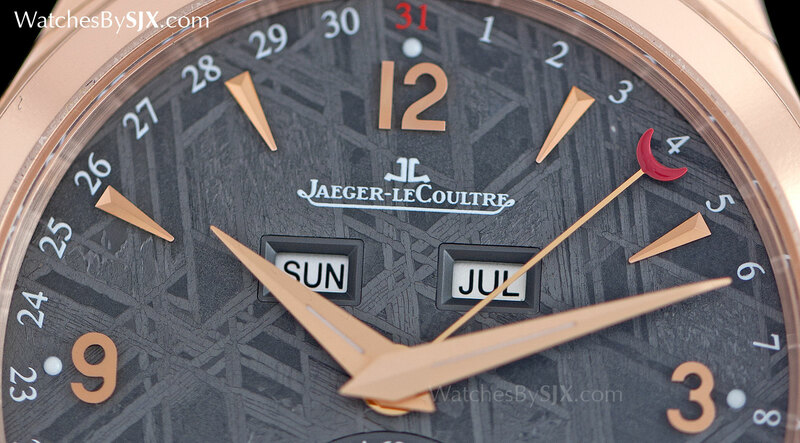 While meteorite watch dials are not new, Corum offered such dials back in the 1980s, this is a first for Jaeger-LeCoultre. Composed mainly of iron and nickel, iron meteorites are always used for watch dials (meteorites can also be stone or a combination of the two), because of the attractive pattern that emerges when they are sliced up. The Widmanstätten pattern comes from the iron and nickel crystal inside the meteorite, with every slice being different. Each slice of meteorite is etched in acid to highlight the Widmanstätten pattern, best described as geometric brushstrokes. Depending on the treatment, the resulting tone of the meteorite varies. 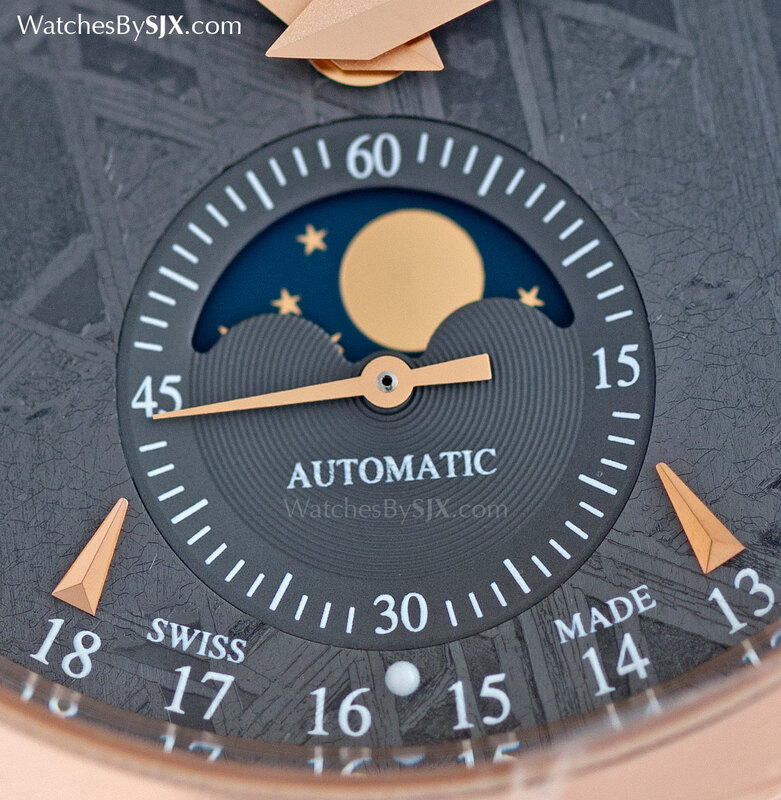 In the steel model the meteorite is a pale grey with blue accents, while the rose gold version is matched with a dark grey meteorite dial and red detailing. 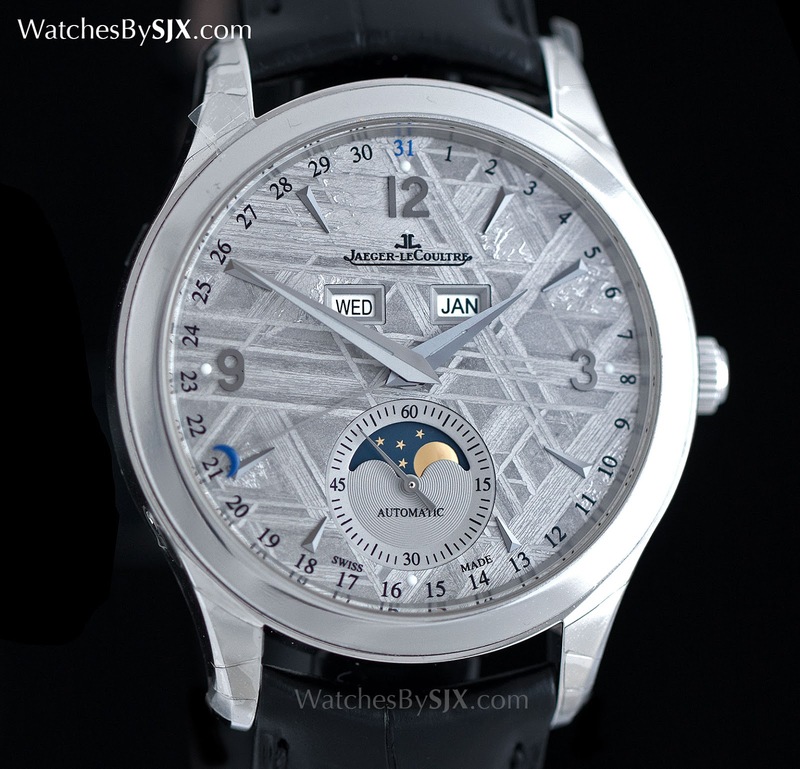 Dial aside the Master Calendar Meteorite is identical to the triple calendar introduced two years ago. 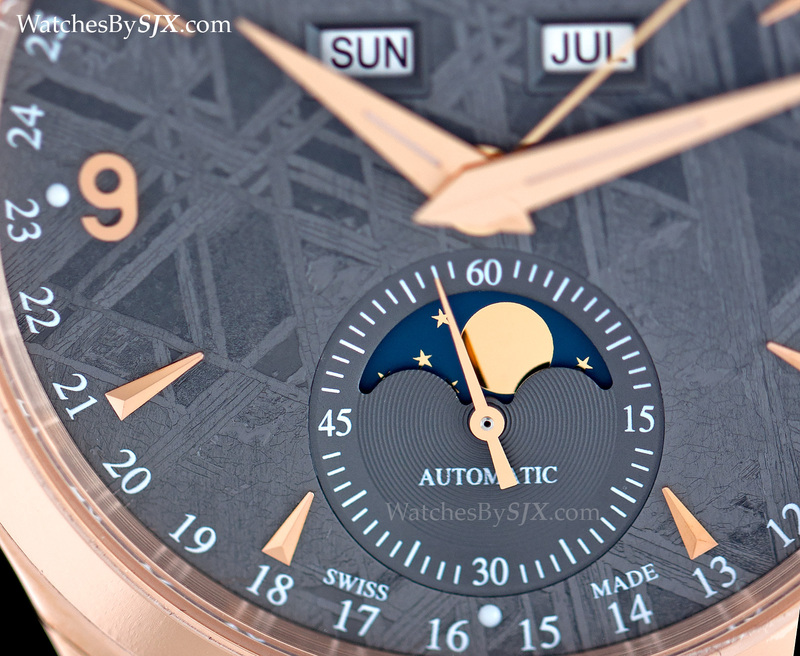 It displays the day, date, month and moon phase, with pushers in the case to advance each indication. 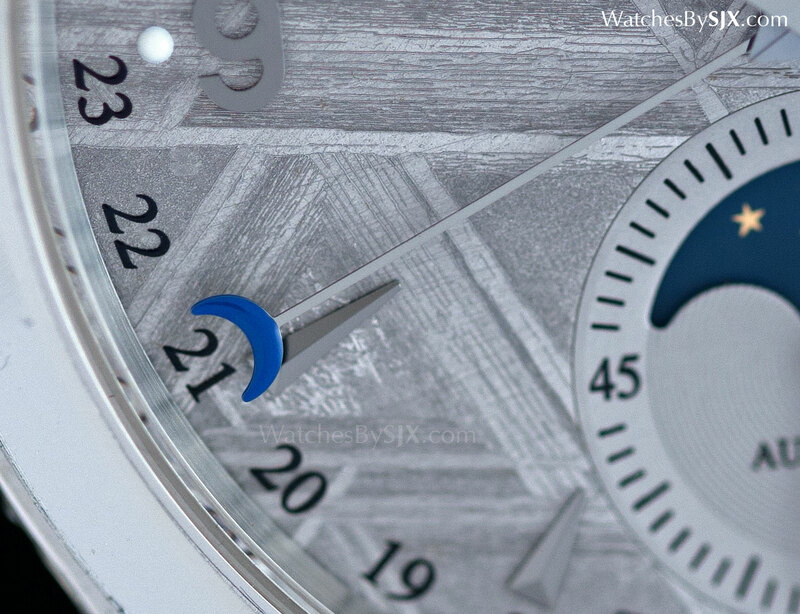 Apertures are cut into the dial for the day and month, as well as for the seconds sub-dial. 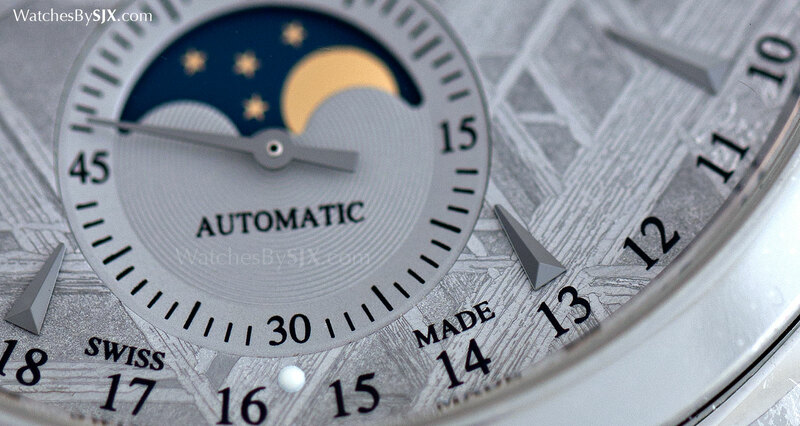 Though the seconds sub-dial is the same colour as the meteorite, it’s actually a galvanised metal disc that’s inserted into the meteorite dial. 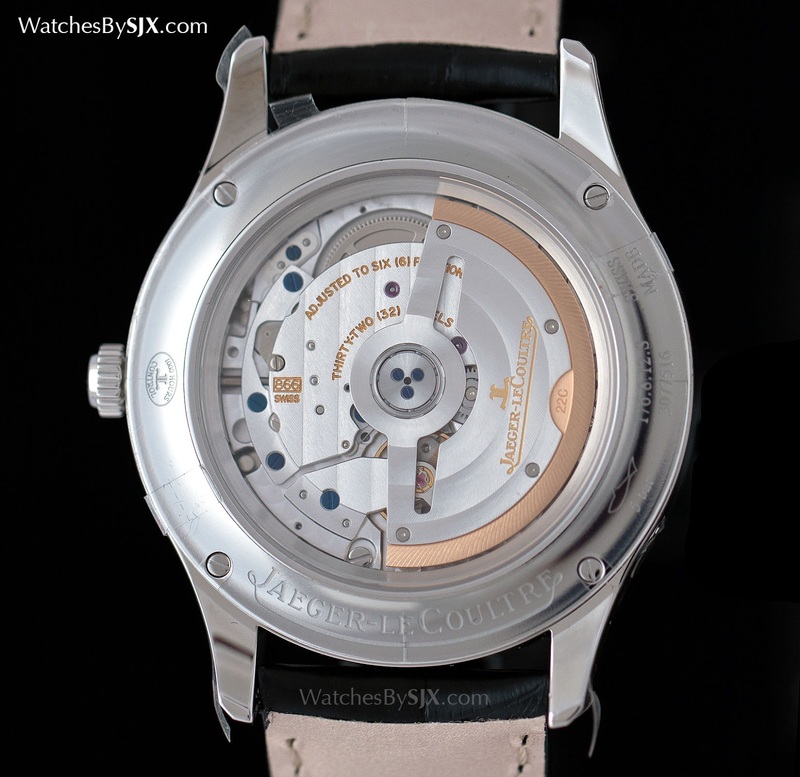 Inside is the calibre 866, based on JLC’s workhorse automatic movement. As is typical of JLC movements, the movement is well constructed with features typically found in higher-end calibres like a free-sprung balance and a 22-ct. gold rotor mass. 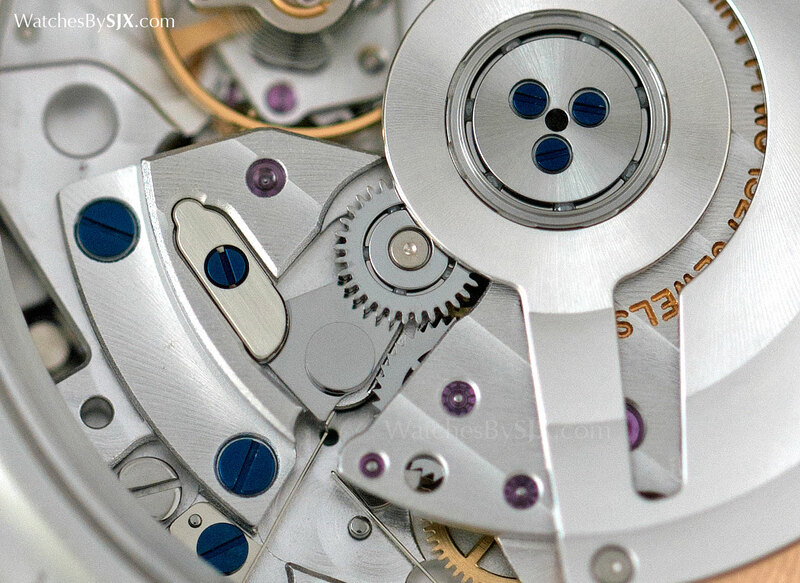 Blued steel screws and Geneva stripes enhance the visual appeal of the movement, which is decorated and produced industrially, but executed to a degree few others can manage on this scale. 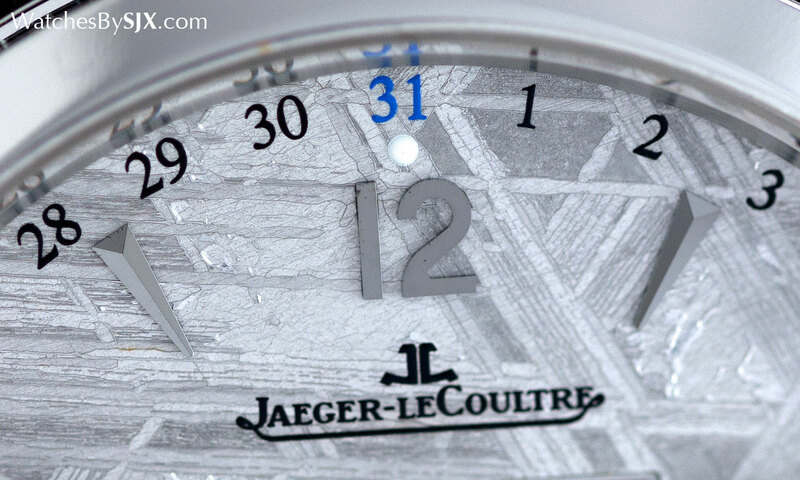 At 39 mm in diameter and 10.6 mm high, the case has modest dimensions, making it an easy fit under a cuff. 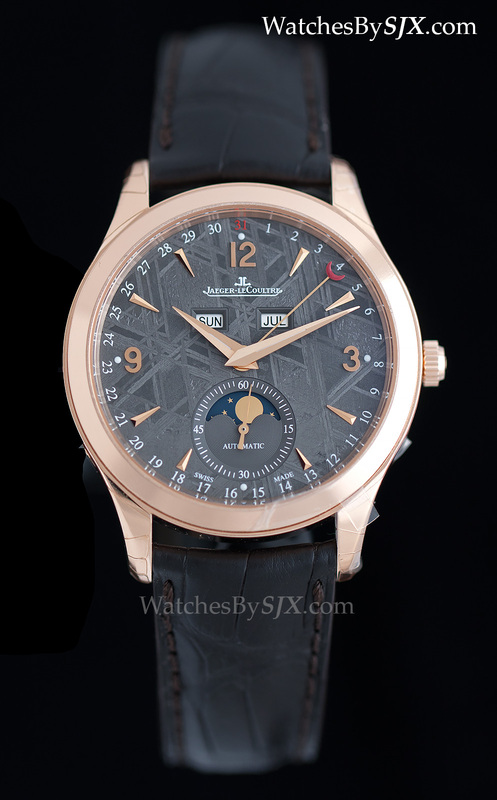 The Master Calendar Meteorite in steel costs S$18,100, while the pink gold is S$35,100. Both prices include GST of 7%, and for international readers are equivalent to US$13,500 and US$26,100 each. Update April 20, 2015: Price revised to reflect new retail price.